Promilless – Äärimmäisen luotettava ja helppokäyttöinen sylkitestiliuska, joka kertoo nopeasti oletko ajokunnossa. No more blowing. Promilless is an extremely reliable and easy-to-use saliva test strip, which quickly indicates whether you are fit to drive. Why is promilless the best alcohol test? What are reliability and precision? The test strip has a patented self-testing feature, which ensures its functioning in case of e.g. incorrect storage or expired dates of use. DO NOT EAT, DRINK OR SMOKE 15 MINUTES BEFORE USING THE TEST. Do not use bubble gum. Prior to the test, ensure you have saliva in your mouth. The alcohol test indicates the blood alcohol content from your saliva. Remove the test strip from the foil packaging. Dip the test strip in saliva for 2 seconds so that the green-yellow test area is against your tongue. The test can be interpreted within two minutes. The green control area may darken earlier. Do not interpret the test result after two minutes have passed. Even the slightest darkening of the yellow test area means there is alcohol in the blood. Only the green control area has darkened: Your blood alcohol content is less than 0.02% (per mill). In Zero product: your blood alcohol level is zero per mill. Both the green control area and the yellow test area have darkened: your blood alcohol content is over 0.02% (per mill). In Zero product: your blood alcohol level is more than zero per mill. * If the green control area of the strip does not darken, repeat the test with a new strip. NOTE! The green control area must always darken - it ensures that the test is functioning correctly. Do not guess whether or not you are in the state to drive. Keep a Promilless strip in e.g. your wallet, and you will not need to think about it. Be careful out at water. Sometimes a few beverages are consumed at shore. Promilless belongs to a smart boater’s standard equipment. The nearest shop may be far away, when you need it. Keep a few Promilless strips stored at the cottage as well. In short, yes it can. This of course depends on the implementation of the product and, how well the behaviour of alcohol in the human body has been taken in to account in the design of the product. Yes, it is. 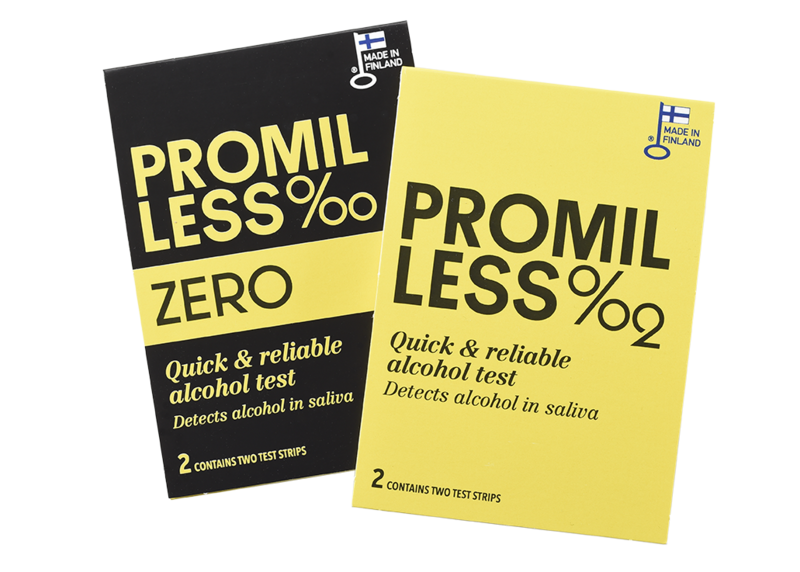 The start-up business from Oulu, Goodwiller Oy, presents its newest innovation, the disposable Promilless alcohol test, on 7th June at the Prinse16 event focusing on printed intelligence technologies at Oulu University.